and a genuine approach to life, we’re the right people! I’m a food writer and photographer. I teach Tuscan cooking classes in the countryside and I have written five cookbooks. I am born and bred in Tuscany. I live in the house that my family built in the countryside between Siena and Florence with my partner Tommaso and my Maremmano sheep dog, Noa. I’m learning to grow a vegetable garden, even though for the moment I’ve only been successful with fresh herbs and a pot of flowers. When I was a teenager I wanted to become a policewoman or a forester. At high school I fell in love with English language and literature. I took a master’s degree in Communication and Media Studies. I dreamt of becoming a businesswoman like Melanie Griffith in Working Girl, but after six years as an employee and event organizer I understood that it was not my cup of tea. It has been hard to find my place in the world, but then I discovered that my place was actually at home, in the Sienese countryside, writing about the food of my land and teaching other people to cook it. Looking back, there was a constant in my life: a passion for food and cooking since I was a little girl. In February 2009 I started my blog, Juls’ Kitchen, to give voice to this passion. Working daily on the blog I learnt to express my love for food with words and images. 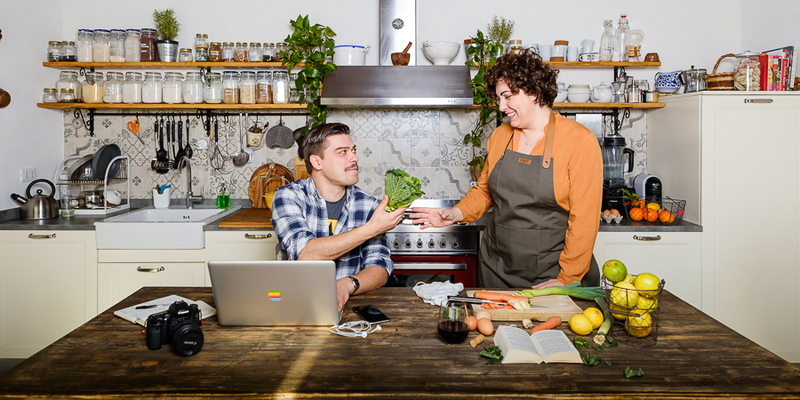 In January 2012 I turned my passion into a job: I am now a freelance food writer, I develop recipes for magazines and companies and I teach Tuscan cooking classes to people coming from all over the world to cook genuine home food in a tiny kitchen in the countryside. I was born in Florence, but I am partially from Salento, Apulia. For this reason I love eating rustici and pasticciotti. Usually, when I’m asked “…and what do you do?”, my answer is: “I taste”. I know it’s a dirty job, but someone has to do it, especially when you have chosen a food writer and cooking class teacher as a life partner. The downside is that most of the time I eat everything cold and at unreasonable hours. I am also the one maintaining in a precarious balance heavy trays in photo shoots until I can not feel my arms anymore, or holding forks or pans as a circus contortionist. Food aside, I give my contribution to Juls’ Kitchen with my experience and passion for Digital Communication. I manage the social channels and I help Giulia with the editorial plan and with the development of new projects. We also teach workshops and food writing courses together. I am also an amateur graphic designer and video maker, as I am the man behind the camera when we film our video recipes (I wonder if I’ll ever receive a star on the Valdelsa Walk of Fame). Read more about me on my blog. 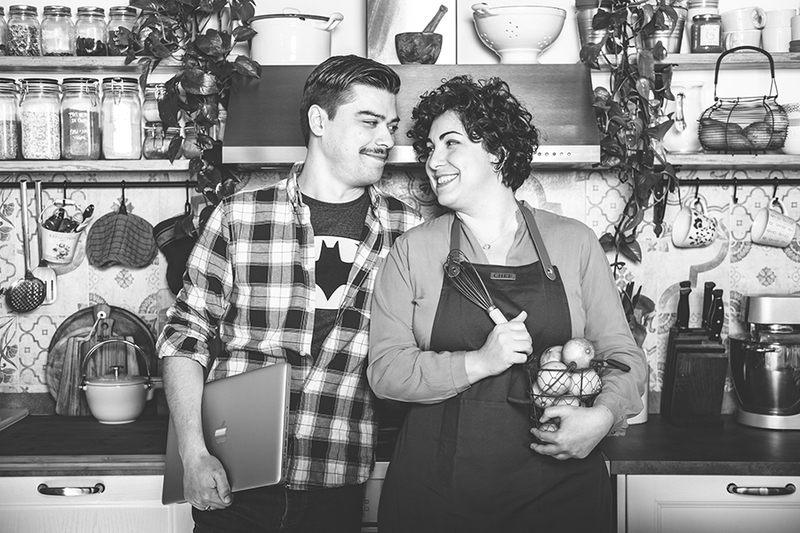 When my partner Tommaso moved in, we decided to restore an old building in our premises to create the Juls’ Kitchen Studio, a space where we cook, take photos, film video recipes. Juls’ Kitchen studio hosts authentic Tuscan cookery workshops, but we also offer short courses in food writing, photography and branding. Each year we host a Fettunta event in our garden surrounded by our olive trees. It’s a great way to meet fellow food enthusiasts and feast together. Fettunta is the other name we give in Tuscany to bruschetta, a toasted slice of bread doused in good olive oil. Now Juls’ Kitchen is a diary of my life in Tuscany, a collection of authentic recipes inspired by tradition and seasonality, my favourite corner where I love to share a good story with you. My work has been featured by The Simple Things, The Foodie Bugle, JamieOliver.com, The Huffington Post, Great British Chefs, Great Italian Chefs, Manfrotto Imagine and more, BBC Good Food, Corriere della Sera. My love for traditional family recipes brought me to write my first cookbook, My grandma’s recipes, a book in Italian and in English about the food we eat at home everyday. In 2012 it was followed by I love Toscana, published by Food Editore, which was also translated into English, Dutch and Polish. In 2014 Cucina da chef con ingredienti low cost, published by BUR Rizzoli, followed, emphasizing on cooking on a budget. In 2015 I worked with Alberto Fiorito, a nutritionist, to write Cucina naturale: Frutta, published by Gribaudo, a book on healthy recipes with fresh and seasonal fruit. My fifth cookbook, La cucina dei mercati in Toscana, was published by Guido Tommasi Editore in February 2017. This book is a collection of traditional and seasonal recipes and a guide to the best food markets in Tuscany. The 2018 English version, From the Markets of Tuscany: A cookbook, is available from the 19th of April in Italy and from the 1st of June in Europa, US and Canada.